"This is the house Susan McSween lived in after the McSween House burned down during the Big Killing. This house is where Arrowsmith's Store is now. That is the Gallegos House immediately behind it and across the street is the house where Annie Marie's Coffee shop is now. The Gallegos House was built circa 1900." The Gallegos House, which is Gary Cozzens' headquarters. 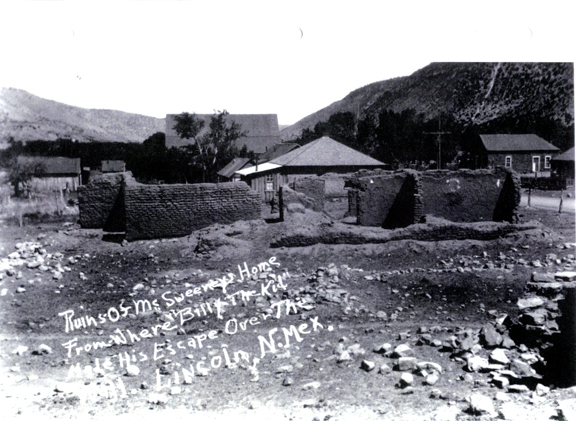 So this photo is post 1900 and the ruins are from Susan McSween's second house. This is so typical of well meaning, but wrong information that ends up being about half right. 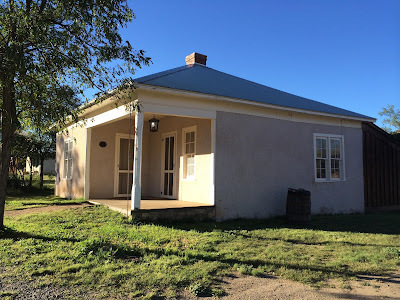 My guess is someone came to Lincoln, asked where Mrs. McSween lived and when they were shown her second home in ruins they assumed it was the house that Billy the Kid escaped from. Honest mistake, or outright fakery, either way it's misinformation, but it is critical to have the right people on site to vet these claims, as in this case with Mr. Cozzens. That said, I am sad to report that Gary is retiring, effective July 29. This is a loss to the state of New Mexico and to anyone who loves the true history of Billy the Kid country. "Forgetfulness is a form of freedom."